AutoCanada CEO Steven Landry: "This is exactly the kind of acquisition that will be instrumental to accelerating our growth. It is a well-established business that is immediately accretive to our earnings and brings new valuable OEM relationships." AutoCanada Inc. has agreed to buy nine of the 10 stores in the Grossinger Auto Group of Chicago establishing its presence in the lucrative U.S. auto retail market. 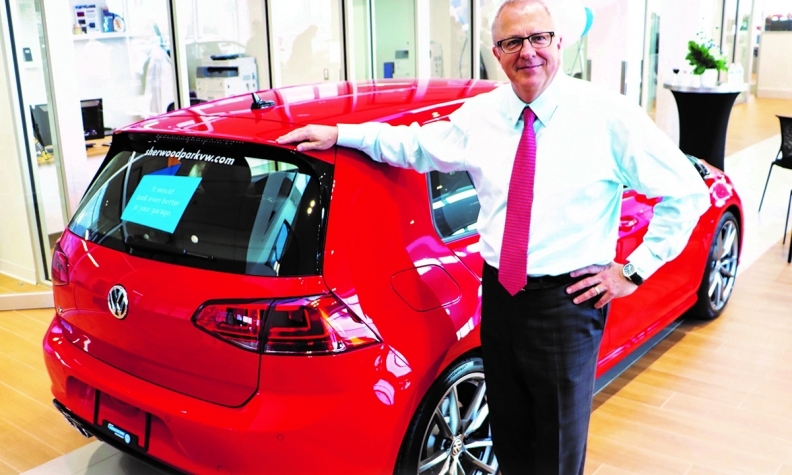 The deal, which is scheduled to close April 9, will add approximately C$523 million (US$400 million) in annual revenue to AutoCanada and is one of the largest acquisitions by an international buyer of a U.S. dealership group. Terms were not disclosed. "This is a pivotal move for AutoCanada as this U.S. acquisition broadens our geographical reach and brand diversification through adding a combination of domestic, import and luxury dealerships to our portfolio," AutoCanada CEO Steven Landry said in a statement early Thursday. "This is exactly the kind of acquisition that will be instrumental to accelerating our growth. It is a well-established business that is immediately accretive to our earnings and brings new valuable OEM relationships." The acquisition gives AutoCanada its first Toyota, Honda, Lincoln and Volvo stores, which Landry said is key to the company’s goal of diversifying its product offerings and its geographic footprint. Landry said AutoCanada will continue to pursue acquisitions in Canada and in the United States in the coming months. “We entertained other American opportunities, but none of them bubbled up like this one in terms of being close to Canada, similar market, culture, feel and seasonality, if you will,” Landry said. He said the company plans on retaining the Chicagoland stores’ general managers and having Americans run the operations. The acquisition is expected to close in the second quarter. "It’s an opportunity for AutoCanada to expand the brand set, as well as a chance to start growing in a much bigger market," said Ryan Kerrigan, managing director of buy-sell advisory firm Kerrigan Advisors in Irvine, Calif.
Kerrigan represented the Grossinger group in the deal. It came after months of private conversations with AutoCanda's leaders who'd expressed an interest in buying dealerships in the United States. "When this sale came up, we thought it’d be a good fit for their foray into the U.S.," Kerrigan told Automotive News. From there the deal took a full nine months to complete given some extra administrative hurdles involved in an international transaction, Kerrigan said. With a foothold now in the U.S., AutoCanada, a public company, can raise "substantial assets" to buy more dealerships in the U.S., Kerrigan said. "They’re certainly looking at that," Ryan Kerrigan said. "They will be actively evaluating opportunities in the U.S."
AutoCanada executives have said they have expansion goals for the next five years, that include a better balance of brands and a stronger coast-to-coast presence in Canada. Meanwhile, “there are fewer sellers in Canada than there are buyers,” Erin Kerrigan told the Automotive News Canada Congress in February. She is a managing director of Kerrigan Advisors. Canadian sellers should expect more interest from American buyers taking advantage of the stronger U.S. dollar, she said. But lower prices for U.S. dealerships have Canadian groups looking south, Kerrigan said. She was working on two U.S. sales to Canadian buyers at that time. When asked by an analyst if “five or six” acquisitions were possible in 2018, Landry said “absolutely,” due in part to the company’s financial strength. The company reported net earnings of C$17.1 million (US$13.3 million) in the fourth quarter of 2017, a year-over-year gain of 24 perc ent. Revenue rose 17 per cent to C$733 million (US$570 million), while same-store sales jumped 11 per cent. Landry said the company was looking to continue expanding its presence outside of its traditional stronghold in Western Canada, while adding to its portfolio of luxury and Asian brands. Grossinger's is a 90-year old company founded by Sam Grossinger in 1928. It grew to be one of the largest auto groups in the country, composed of 10 dealerships and ranked No. 95 on Automotive News Top 150 Dealership Groups based on 2015 data it submitted, Kerrigan said. AutoCanada is buying nine of the dealerships that represent 12 brands: Toyota, Chevrolet, Cadillac, Honda, Hyundai, Kia, Mercedes Benz, Audi, Subaru, Volkswagen, Volvo and Lincoln. Three of the stores are in Chicago, three are located in the Chicago suburb of Lincolnwood, Ill., two in Palatine, Ill., and one store in Normal, Ill., a college town about mid-way between Chicago and St. Louis. Grossinger's Buick GMC Cadillac store in Lincolnwood, Ill., was sold separately to Zeigler Automotive Group in Kalamazoo, Mich. It is called Zeigler Buick GMC Cadillac Lincolnwood. The Grossinger family opted to sell largely for succession reasons, Ryan Kerrigan said. "The Grossingers had been in the business for three generations," he said. "As they looked ahead to the fourth generation, they didn’t see it continuing the family legacy and thought it was the right time to sell." Grossinger Co-President Caroline Grossinger said it was a "heartfelt and bittersweet" decision to sell. Grossinger wanted to ensure a buyer was "aligned with our priorities of providing employees security, continuity of our community relationships, and our focus on customer experience," she said in a media statement. "We were able to find such a group with AutoCanada." Foreign investors in auto retail is not new. In the 1990s, Chinese company DCH started buying U.S. dealerships. It still exists today only Lithia Motors Inc. owns it now. DCH stands for Dah Chong Hong, which means "great prosperous company" in Chinese. Likewise, U.K. dealership group Pendragon controls dealerships mostly in the UK, but also in Germany and California. Last year, Pon Holdings BV, a transportation and mobility company and luxury brand distributor in the Netherlands, invested in IndiGO Auto Group of Houston. The size of the investment and of the stake that Pon took in indiGO were undisclosed. IndiGO Auto Group has 10 dealerships in Houston, St. Louis and Palm Springs and Rancho Mirage, Calif. The group sells 11 luxury brands: Porsche, Audi, Jaguar, Land Rover, Rolls-Royce, Bentley, Aston Martin, Maserati, BMW, McLaren and Lamborghini. John Irwin of Automotive News Canada contributed to this report.